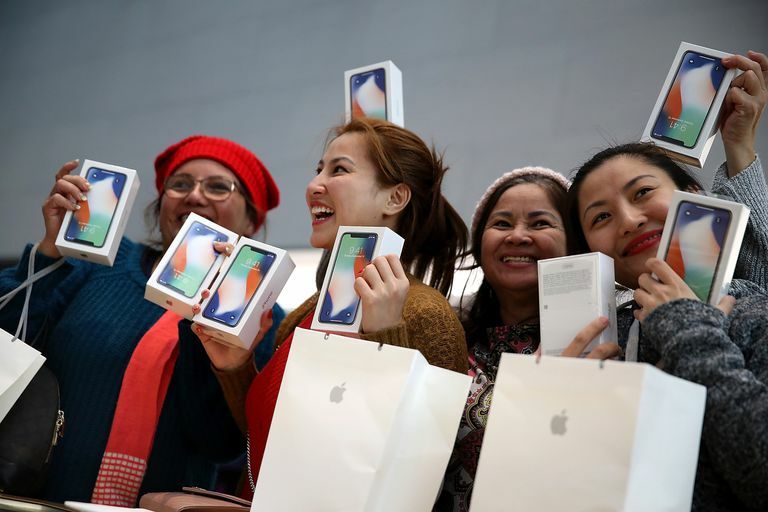 Every year, Apple releases new iPhone models packed with exciting new features, and no matter what iPhone you have, every iPhone user gets a little urge to upgrade. Most don't upgrade every year because it's expensive, but what if you could spread out the cost of the new phone over 24 months? If that sounds good, Apple has just the thing for you: the iPhone Upgrade Program. What Is the Apple iPhone Upgrade Program? The iPhone Upgrade Program is an offering from Apple that lets you buy a new iPhone and pay if off via monthly installments, rather than in a single, upfront purchase. It also lets you upgrade to a new phone every 12 months. Under the program, you can choose from any of the current iPhone models (as of this writing, the iPhone 8, iPhone 8 Plus, and iPhone X) and storage options. It's similar to installment programs offered by phone companies, but instead comes from Apple and includes an Apple extended warranty. That's the key question, right? What you'll pay each month using the iPhone Upgrade Program depends on what model you get and how much storage you want. Buying a 64 GB iPhone 8 will cost less each month than a 256 GB iPhone X. According to Apple's page about the Upgrade Program, the lowest you'll spend each month (for that 64 GB iPhone 8) is $34.50, while the most you can spend (the 256 GB iPhone X) is $56.16 per month. Other model and storage capacity combinations cost between those amounts (monthly payments will change as the prices of various iPhone models change). Even though you can upgrade every 12 months, prices are calculated over a 24-month term. If you choose to upgrade before the end of the 24-month term from a lower-cost model to a higher-cost option, you'll just pay the new price each month going forward. For example, if you currently have a phone that costs $35/month and want to upgrade to one that costs $50/month, you'll start paying $50/month after upgrading to the new model. Getting the latest iPhone every year: Since you can upgrade every 12 months, you'll always have the latest and greatest iPhone model. If being on the cutting edge is important to you, this is probably the best way to buy an iPhone. Pay the same price: Whether you're buying your iPhone at full price up front or using installments, the total amount you spend on your iPhone will be the same. Spread the cost out: New iPhones are expensive. Paying monthly lets you avoid spending $700+ all at once. That's easier to budget for and doesn't require a big upfront outlay of money. Never pay full price for an iPhone: Because you're upgrading every 12 months, you'll never pay the full price for your iPhone. Since the program bases its monthly cost on a 24-month period, twelve months of installments will add up to less than the phone's full price. Includes AppleCare+: The AppleCare+ extended warranty program is an add-on for most iPhones, but it's included with the Upgrade Program. This ensures that your phone's covered for common kinds of damage. Works with your carrier: iPhones bought through the program work with all major carriers — AT&T, Sprint, T-Mobile, and Verizon — so you can stick with your current phone company and monthly rate plan when signing up. Get credit for your old phone: If you own your old phone, you can trade it in for a credit that reduces your monthly cost (the price will go back up to normal after the credit is used up). The phone is unlocked: All iPhones bought through the program are unlocked, which gives you the flexibility to take them to different phone companies if you prefer. You have to buy AppleCare+: AppleCare+ is included in your monthly cost and you can't opt out of it. While that gives you coverage and protection, it also raises the total price of the phone. If you're looking for the absolute lowest price, the upgrade program won't deliver it. You don't own your phone: If you pay full price for your iPhone upfront, you own the phone and can do whatever you want with it. With the program, you don't own your phone until you've paid for 24 installments (if you upgrade every 12 months, that clock resets after each upgrade). Another monthly bill: While you're spreading out the cost of a new phone, you're also signing up for another monthly bill that you'll pay, essentially, perpetually. It's actually a loan: Technically, using the iPhone Upgrade Program requires taking out a loan. This isn't the normal loan process — you don't have to go to a bank or fill out a lot of paperwork — and it's got 0% interest, but it will show up on your credit. Requires a credit check: Because the installment plan is a loan, it requires a credit check. If you have bad credit, you may not be eligible for the Upgrade Program. You may need to pay an ETF: If you're under contract with your phone company, or are still paying installments on your current phone to your phone company, you may need to pay an Early Termination Fee (ETF) or the remaining cost of your phone. ETFs can cost hundreds of dollars, and depending on how many installments you have left on your current phone, the price to switch may be hefty. Should You Use the iPhone Upgrade Program? The answer depends on your situation and your preferences. As noted earlier, what you pay with the program for an iPhone and AppleCare+ is identical to what you'd pay buying directly, so you're not saving money, but you're also not spending extra either. The decision will probably come down to what it will cost you to sign up (if you still need to pay off your current phone), whether you want to add a new monthly bill, and how important getting the latest iPhone model every year is to you. If you're ready to sign up for the iPhone Upgrade Program, go to this page for Apple's iPhone Upgrade Program and Tap Join Now. The process is largely like buying an iPhone, but instead of providing your credit card info, you'll enroll in the program instead. Want to switch iPhone to Verizon? Make sure to know the costs first. Why Won't My iPhone's Bluetooth Connect? Here's Why! Can't decide between the iPhone 5S and 5C? Read this.